Given his penchant for lurid Hitchcockian thrillers like Dressed To Kill, Blow Out, and Body Double, Brian De Palma was not the man many would have expected to adapt Daniel Lang’s 1969 New Yorker article about a Vietnamese girl who was raped and murdered by four American soldiers on a reconnaissance mission. 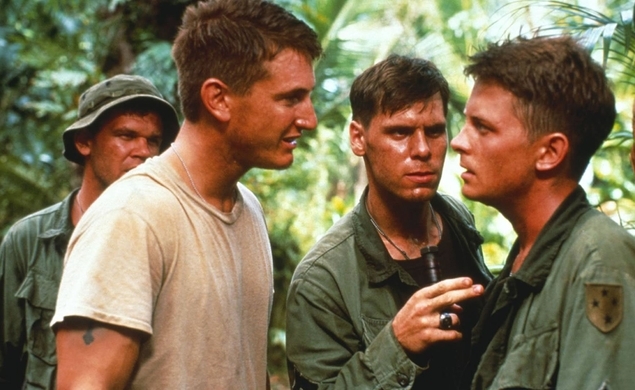 And save for Pauline Kael’s famously rapturous review, Casualties Of War opened to mixed notices and disappointing box office, along with criticism that De Palma’s filmmaking bravura took away from the seriousness of his story. But De Palma’s films have always been laced with political and social commentary, and to my mind, the boldness of Casualties Of War is key to its power—not only in heightening its emotional impact, but also in implicating bad actors in the U.S. military, which even films about the Vietnam War were hesitant to do. Sean Penn stars as the leader of the mission, who offers up the villager to his men for recreational purposes, which here means five days of violence and sexual abuse. Four of the five go along with it—though a couple have to be coerced—but the fifth, played by Michael J. Fox, objects and attempts to take the matter to his superiors after the mission is over and the girl has been killed. The stonewalling he encounters underlines the key point De Palma is making about the moral vacancy of America’s misadventures in country. Casualties Of War plays Saturday at 8 p.m. Eastern on Encore Action.